Kimberly A. Anderson, MS, OTR/L, is an occupational therapist on the outpatient team at The Children's Hospital of Philadelphia. 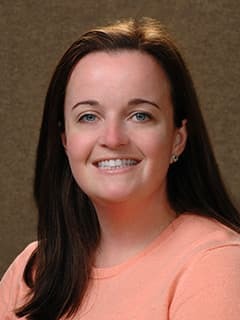 Kim Anderson, MS, OTR/L, has been an occupational therapist at The Children's Hospital of Philadelphia since 2012 and a pediatric therapist since 2008. She provides outpatient-based therapy services, interdisciplinary specialty clinic consultations/evaluations, and participates in clinical research. Her specialty practice includes the use of splinting and dynamic movement orthosis for patients with neuromuscular diagnoses. Kim specializes in aquatic therapy for children with a variety of medical diagnosis, including neuromuscular diagnoses, brachial plexus injuries, hemiplegia and Trisomy 21. She and a physical therapist lead an aquatics group for toddlers with Trisomy 21 and their parents.